First time playing airsoft. Airsoft is quite fun, although this past weekend thoroughly demonstrated that my skills in the infantry are in every way lacking - from movement, tactics, and aim. Granted, the airsoft bbs have a large tolerance for accuracy and the precision is not much better than the accuracy. My hammock was a success! 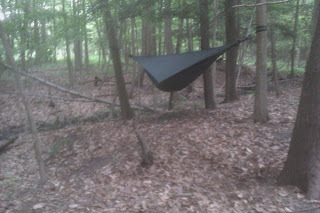 The hennessy hammock I picked up last Christmas was delightfully comfortable and a quick setup and take down. I feel like it is also easier to get in and how without letting bugs in compared with a tent. Like always with camping, I seem to get eaten alive. This time I tried the Bug Band. I wore this around my left wrist and here are the results (note the image is reversed). 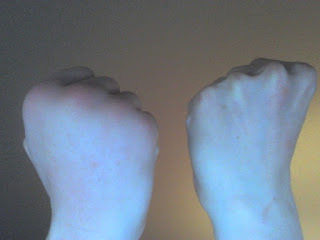 Both hands do have mosquito bites, however my right received enough to be entirely swollen. Based on this I would have to say, the Bug Band does have an impact in reducing mosquitoes but is limited up to a 1 foot radius. Do note that I used other repellent as well all around my body. It was another encouraging weekend, but now it is time for bed to prepare for the work week and cleaning (gear, condo, and bike)!